A system for creating content that's proven to get social shares and backlinks. Strategies that are used by some of the top internet marketers. A step-by-step process you can repeat over and over again. After a couple months, I had experimented with enough traffic and SEO techniques to figure out which ones worked best and which didn’t. I combined those strategies into a system I could repeat over and over again. Not only for this website, but for any site I worked on. We also built an email list of 10,000 subscribers who are able and willing to buy from us. The site is now a 6-figure online business that is poised to hit 7 figures within the next two years. That’s when I knew I had to write this book, so that other people could learn the same tactics and strategies that were getting me results. And so that other people could figure out a repeatable process they could use for their own sites to get these results again and again. Traditional content marketing tells you to "publish great content" and "distribute it in all the right channels." That’s it. So people brainstorm content ideas and start churning out this great content. They publish it on all of their social media accounts and maybe get a couple shares and traffic. Maybe this worked in the early days of content marketing, but it doesn't anymore. Successful content marketing involves taking action. It involves taking the RIGHT actions. This is more than book. It's a mini-course. I went into painstaking detail describing each action you need to take. The book also includes pre-made spreadsheets, so you don't have to waste time getting organized. Some of the top marketers in the field were kind enough to include their wisdom and insight. In each of the major sections, you'll find a Q&A from marketing experts, like Rand Fishkin and Jeff Bullas, giving you their knowledge. At the end of each chapter, there is a list of items to complete before moving on to the next part. This keeps you organized and accountable as you navigate the book. "Everything you need to stop wishing and start doing..."
"Marketers tend to get hung up on the nuts and bolts of great content marketing. Michael provides everything you need to stop wishing and start doing." "I’m going to tell you (every step of the way) exactly what to do to create content, drive traffic, build an email list, and rank in search engines." These strategies are backed by case studies and insights from some of the top minds in the field. If you're struggling to figure out content marketing, traffic generation and SEO, this book will teach it to you. These are the exact strategies and tactics I use to help my clients grow their businesses. They can do the same for yours. "A very practical guide to implementing solid content marketing strategies that are proven to work." "Michael, this is a truly excellent book! Read the whole thing, very impressed. It's a very practical guide to implementing solid content marketing strategies that are proven to work. You manage to be comprehensive and detailed, but very clear and simple, without ever overwhelming the reader. This book shows how anybody can implement the latest content marketing techniques to build traffic and subscribers, through a simple step by step process that's easy to follow. Highly recommended." "Michael helped to generate over 100,000 monthly visitors to my website." "Just one year ago, Michael asked me if I needed help marketing my business. He put together a growth playbook unlike anything I've seen before. In just 10 months, Michael helped to generate over 100,000 monthly visitors to my website, and he helped me build an email list of 10,000 community members. I thought I knew about topics like SEO and content marketing and growth hacking...until I saw what Michael does. I can't recommend his strategy enough. Doesn't matter what industry you're in, or how experienced you are with marketing. Michael's playbook works. If you actually sit down, work hard, and implement the tactics in this book, there's no reason you won't also find success." "A Step by Step Process For Getting Results - Again and Again"
You won't find such an all-inclusive resource anywhere else. 100% Satisfaction Guarantee. Unbeatable 30-day money-back guarantee. Button redirects to a trusted and secure ebook retailer (Payhip.com), where you can choose to pay with your choice of Paypal, credit, or debit. "This ebook will ensure that you aren't just creating content in vain." "It took me several years to learn the tactics included in this book. I envy any new marketer that picks it up." "It took me several years to learn the tactics included in this book. I envy any new marketer that picks it up, because you won't have to go through all of the trial and error, lost money, and months of frustration that I went through when learning content marketing. ​This guide includes it all! The SEO strategies alone are priceless!" "Michael’s book is here to help you convert your content effort into real, tangible results." “Everyone’s talking about content marketing. And almost everyone’s doing it. But not everyone is winning at content marketing. This book is DESIGNED to get you results. I have read a ton of ebooks (free and paid) that told me what to do but not how to do it. This leaves a lot of information on the table that you have to figure out on your own. Now is the time to start getting these results. Reading more blog posts isn't going to cut it. You need a system — a process. I know this because I read blog post after blog post to learn this information. And it took me even longer to put it into steps I could repeat over and over again. You've already spent too much time reading information you can't put into practice. 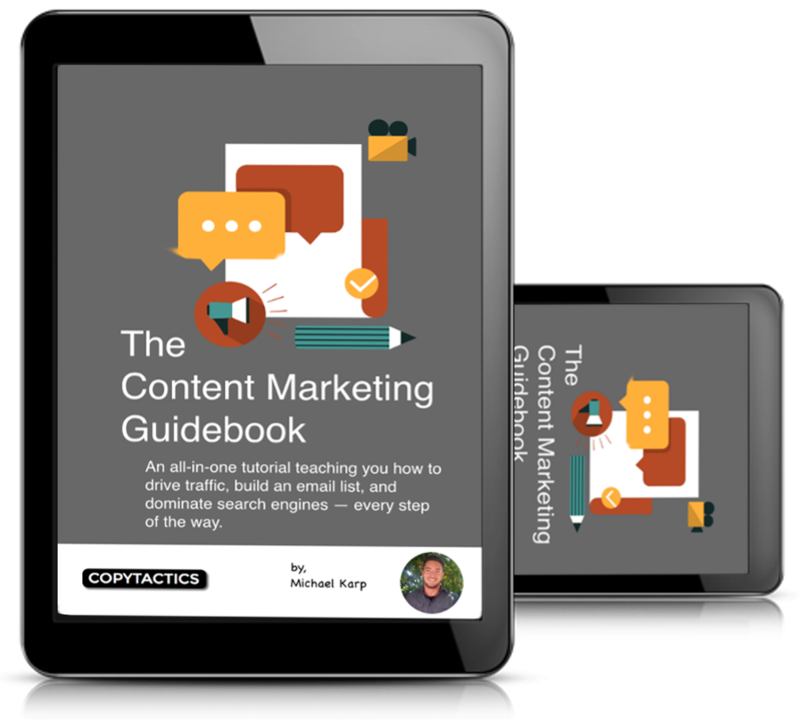 The Content Marketing Guidebook shows you which actions to take and exactly how to take them, with step-by-step instructions and screenshots for every tactic or strategy. One click gets you 20% off the full sale price. You are fully protected by my 100% Satisfaction-Guarantee. Read the entire book and if you aren't satisfied within 30 days, send me an email and I'll send you a prompt refund. "Why the 1 month guarantee? Because I'm that confident you will get results." This book is for people who want more traffic, subscribers, leads, and customers. It's for people who want a step-by-step process they can repeat whenever they want to drive traffic, build their email list, and rank in search engines. Feel free to read the entire book, and if you aren't satisfied within 30 days after your purchase, simply send me an email at michael@copytactics.com and I will give you a full refund, no questions asked. How Do I Get a 20% or 50% Discount Off the Book? You can get a 20% discount by sharing the book on this page. You can get a full 50% discount by subscribing to my blog here. You're going to learn, step by step, how to grow your business online. These are the same strategies I've used to bring in thousands of visitors, subscribers, and customers every month for myself and my clients. This book takes you by the hand, with screenshots and instructions, to walk you through exactly what you need to do to grow your website and business. Want 50% Off The Book?